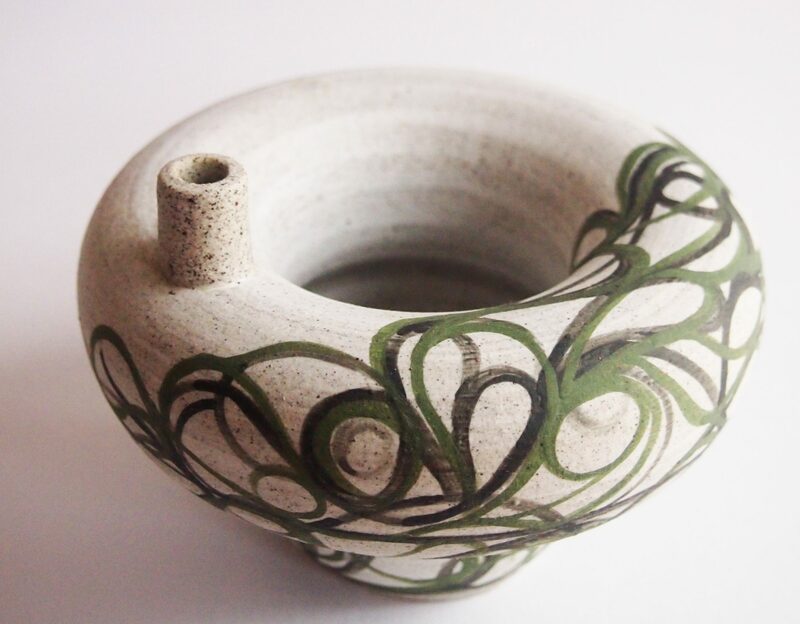 ‘Weave Bowl’, it’s about connection. It is part of an ongoing investigation into my two craft practices of ceramics and weaving. It’s a considered dialogue of how I combine the materials, how they speak, influence and connect with each other. ‘Weave Bowl’ is a wheel thrown porcelain bowl decorated with an inlay pattern influenced by my meticulous weaving stitch, which I call ‘weave lines’. This decorative and repetitive line detail, like its neolithic counterparts, creates a visual connection from the past to the present. ‘Weave bowl’ is no longer a fibre item, fragile and prone to decay but strong and permanent. Finalist and Awarded “A Recognition Award’ in 2017. “Woven Family’ is a series of porcelain slab wrap vases made from a template taken from a textile yarn cone. The starting point of a ‘left over’ item from my textile practice is a new beginning for my ceramic practice, this continues the ongoing conversation. The inherent cylindrical cone shape translates well when recreated with fine translucent porcelain. These hand built forms are decorated with an inlay pattern influenced by my meticulous weaving stitch, which I call ‘Weave Lines’. This decorative and repetitive line detail, creates a visual connection between the works and details a ‘thread of conversation’ in and between the works. Each vase is unique but are from the same family. The introduction of colour through marbling and nerikomi adds a focal point to anchor the ‘weave line’ conversation. They promote, interact and influence the ‘thread of conversation’ between the works. Finalist in The Manningham Ceramic Award 2017. A ceramic sculpture created using doubled walled forms of porcelain and stoneware. Decorated with blue porcelain slip inlay decoration. Inspired by the simple play of early childhood and the tactile nature of clay in its purest form. Emerging Artists Shortlist, Mansfield Ceramics.